"Mediumistic people have loose vehicles of vitality and always tend to extrude part of that along with the Astral Body - but this enveiling feature generally returns, along the "silver cord" to the physical body, so that originally composite "double" becomes simple." In this following article I want to demonstrate that there are a series of phenomena in OBE's which evidently are linked to etheric matter and which do not belong to the astral body and the astral plane. 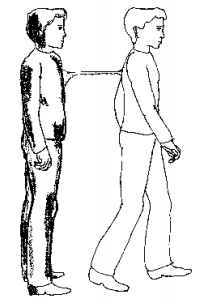 The "composite double" (composed of the etheric and the astral body, like shells telescoped into each other), here called etheric body (for simplification), is dissociated from the physical body by special techniques which are different from common astral projection techniques. Nevertheless, OBEs in the etheric body can turn into astral travelling. Due to this latter fact, the existence of an etheric body is very often ignored – which leads to confusion and to a lack of understanding of different reports of experiences. Some of the most common features are mentioned in this article, basing on own experiences. Bound to the physical world, something exists which forms a bridge between the physical and the astral plane. You can use smoke as an analogy: smoke is visible like solid matter and it is light as air; actually it consists of both elements. In the same way, this subtle matter lies between the physical and the astral world. The terms which are used for the ether are based on different philosophical and traditional backgrounds and therefore emphasize slightly different aspects: ether, Chi, Ki, Prana, Od, fluid, bioplasm, vital energy etc. While OBEing with the etheric body, it is possible that all etheric matter of your subtle body is reintegrated into the physical body back again (as a consequence of increasing distance to the physical body). Your consciousness stays in the astral shell which remains then, and your etheric OBE has turned into astral travelling. This is easily explained in theory, but practically it veils the differences between etheric and astral OBEing. For this reason, in many publications no difference is pointed out at all. As a consequence, considerable confusion arises. The IBE state (still being in the physical body, but with astral awareness) can be seen as a preliminary stage of OBEs. In this state, frightening situations may occur, but they are safely overcome when you are fearless and/ or curious. After some confrontations with the phenomena of this kind of preliminary stage, one gets used to them. It is a very interesting field to learn about. "Astral sensory perception" is possible in the etheric state, which means your consciousness shifts into the astral body and you are able to perceive with the astral body. But sometimes you may instead have "physical sensory perception", where you perceive the physical and not the astral world, though being in the etheric body. There are two kinds of visual perception - astral vision and at some rare occasions "physical vision". However, very often the astral visual perception is not yet established when starting an etheric OBE. Therefore, no vision exists (you are wrapped in blackness). "The lack of visual perception for me was very annoying. Wrapped in deepest darkness, I stepped forward into the black night, having nevertheless a good orientation by a kind of inner space perception. At a certain distance from my physical body I was always able to see. This kind of vision was astral." As I suppose: though etheric matter is existing, no etheric plane exists and therefore no etheric sight. "When I saw objects, they were not identical to those of the physical plane – even if it seemed so at first glance. Therefore, I did not see the etheric counterparts of the physical plane (structures of both should be identical, as theosophists say and as I believe as well). On the other hand, for instance, being in the etheric body I once saw my guardians (living on the astral plane), whom I knew because I have met them several times in the astral plane." "Physical vision" is often reported in NDE's. There are as well some rare OBE's where the physical environment is seen and heard, but they are rather an exception and difficult to explain. It is also possible that you see nothing at all, but instead you possess a kind of inner space perception. This perception can be so precise that you are even able to perceive colours without actually seeing them visually. As consciousness is shifting more and more towards the etheric body, the etheric body gains liveliness and independence. The consciousness in the etheric body state has always been clear, as to my experiences: I was alert just like in a normal and awake state during the day. Therefore, I often thought I had woken up and fallen out of trance. But by ignoring this seemingly awake state and by continuing my exercises nevertheless, I usually was very amazed when I became aware that I could move my etheric limbs. When testing my mobility, there usually were no difficulties to move my legs, arms and head. In contrary to my limbs and head, the trunk mostly was stuck firmly in the physical body. As I was OBEing more frequently, this difficulty of sticking to the body vanished. From then on, stepping out became more and more easy. "It's a curious thing to see ektoplasma flowing slowly out of the mouth, in its viscosity like honey. It was a broad stream of greyish color, with black, crystal-like spots. At the edges it seemed to evaporate like steam." When starting my trance in an armchair, usually considerable salivation occurred. After a while, when I drifted to a deeper relaxation, I felt something like cold wind or a cold liquid, which seemed to flow from the right edge of my mouth down to the chin. For a long time I could not distinguish if it was cold saliva or cold wind. Over the years I found out that it was "cold wind" – a sensation caused by skin contact with ectoplasm, as I suppose. "I never had ectoplasmic emanations which were so dense that I could actually see them in the physical. But I am familiar with the sensation of "cold wind". This occurred relatively often, when I was in an energetically aroused state. I used to sense something like cold liquid or wind streaming out of orifices of the body. It wasn’t visible and the sensation was not strong, but it was quite distinct nevertheless. When being in the etheric state, I sometimes clearly felt and saw ectoplasm streaming out of orifices of the body, but here it definitely felt more like liquid than cold wind." Sometimes I had the sensation of being touched by spirits (I usually was wrapped in darkness). When I felt a kind of pulsating knock at the soles of my feet or at the base of the spine, this was a signal to me that obsession spirits wanted to enter and incorporate my body. When I felt bothered, I took a grip on them and then threw them away. Except for one occasion, they always seemed to have nearly no weight. I was not afraid, and there was no real danger. It's not possible for a healthy person to be obsessed. In all "stepping out"-OBE's, which were induced in a trance state, I could feel the pull of the silver cord, which limited my excursions to a certain distance from the physical body. The distance was too short to make longer excursions and to experience interesting situations. Therefore, the silver cord was a bothering limitation for my OBEing when using the "stepping out" method. After having moved to a certain distance (50 – 70 m) I usually felt the pull of the silver cord. Struggling against this fixation, I had no chance to move further and in the next moment I was back again in my physical body. In etheric OBE's – although I felt myself bodily present in the subtle shell – I had acoustical inputs from my physical body. For instance I heard loud noise of cars and tram (I used to live nearby a noisy street back then). I could suppress this interference for a short time and continue my travelling. If the noise was too loud and persistent, my attention was caught by it unwillingly and I was pulled back. Stepping out of the physical body in trance or in the state of false awakening. Rolling out of the physical body. Floating out of the physical body.